The part of taking the eggs is a bit laggy. 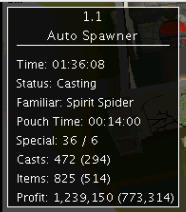 The bot clicks "walk here" while it clicked "take red spiders' eggs" a second before and so it is walking back and forth not really doing anything. It works, but it isn't flawless, the bot loses some time doing that and it doesn't look very human if you watch it for a few minutes. 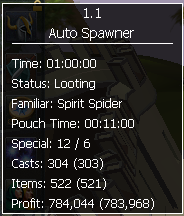 I think a little bit more clicking precision and the bot's mouse speed lowered would solve it. It should just click once, of course on the right spot and then wait 'till it picked up the eggs before doing something else. But hey, it's just some feedback that would make it even more awesome, good job! 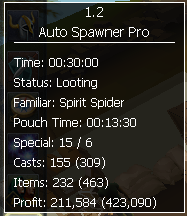 I think a little bit more clicking precision and the bot's mouse speed lowered would solve it. Neither of which I have control over. The client dictates mouse movements and speed, not the script. So or is always 1m+, or is that on the high side? High-side of things. But I haven't gotten less than 800k/hr with current prices. Good idea but you should add papaya spawning. I think you need 69 summoning but you probably wouldnt even really need to test it if you've got red eggs working. Updated. Added Fruit Bat support. 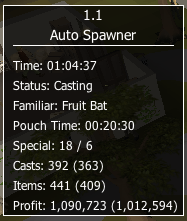 I'm unable to bank correctly with fruit bat. Opens bank and sits there until I manually deposit the papayas but then still doesn't close the bank then forcing me to close it. Then it will continue normal. 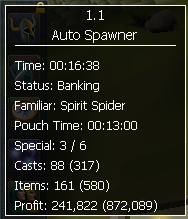 bank.deposit() apparently returns false if you don't have the items in your inventory. It screwed up one of my methods; should be fixed now (whenever the SDN updates). Oh man nice! Planning to go premium? It doesn't have the runs to go premium. Well i assume it will eventually and at the profit it is making it would be foolish (imo) to keep it free. I just made it because I needed some quick RSGP. - Look for text "too far away" and then call familiar in case it gets stuck behind the Edge bank door. There's already something for that. I dropped it from 3 to 2, so maybe it should work a bit better. Everything should be working fine and dandy now. Great script just tried it. 150k in ten minutes. yea sometimes the the bank is out of the game screen and the bot just afks attempting to click out of the screen to bank.